General Gardihewa Sarath Chandralal Fonseka is very much in the news these days. The former army commander has had his lost rank, titles, honours, decorations and civic rights restored. He is likely to be made Field Marshall and may very well enter Parliament in the days to come. General Fonseka was deprived of his basic rights and cruelly victimised in a blatant display of revenge taking by the Rajapaksa regime for having contested the Presidential poll of 2010 as common opposition candidate.Within a fortnight of the Presidential poll held on Jan 26 2010, Genera Fonseka was forcibly dragged out from his office by soldiers formerly under his command and detained. Subsequently he underwent mock trials of different types and was imprisoned in a flagrant travesty of justice. Currently General Fonseka is being lionised widely. He fully deserves it. However when he was arrested there was very little media publicity about the way in which he was arrested.The first news report providing extensive details was posted by me on my blog. 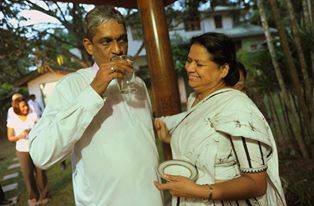 It was on 8th February 2010 that General Sarath Fonseka was arrested. He was taken into custody by a contingent of soldiers on a Monday evening while he was engaged in a discussion with some political party leaders. Information was scanty at the time of the arrest about the manner and mode in which the ex – army chief was arrested although it was expected. Upon hearing the news I got in touch with many contacts on the phone and gathered some details. I was able to reconstruct the arrest story within a few hours and post it on my blog. The story of his arrest as posted on my blog was well – received and within hours the reader toll increased greatly. The following days also registered high levels of visitsIt was also picked up by the media on a wide basis and was used as source material by various media personnel. It is noteworthy that President Maithripala Sirisena has gone on record that a horrible fate at the hands of the Rajapaksas was in store for him had he lost the election like Sarath Fonseka. Against that backdrop I thought that re-posting the article would be of interest to readers to revive memories of how Gen Sarath Fonsekas was unfairly arrested then. In a disturbing turn of events, retired four star General Sarath Fonseka was taken into custody by a contingent of military police on the night of Monday, February 8th 2010. 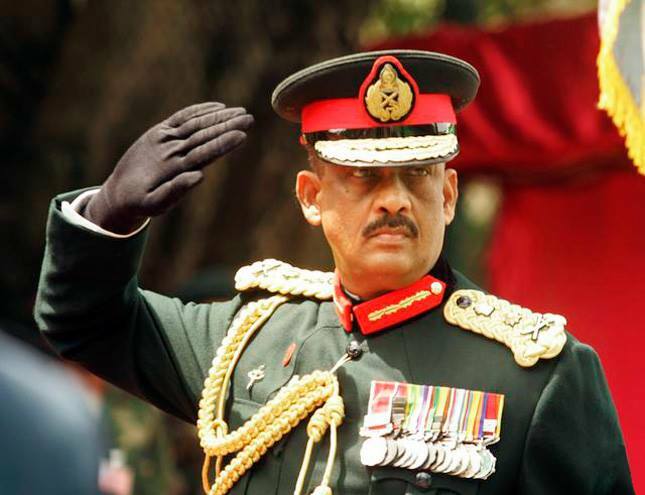 General Fonseka a widely regarded as the most successful army commander in post-Independence Sri Lanka was roughly manhandled, assaulted and forcibly dragged away by military personnel who had saluted him with respect only a few months ago. The ex-army chief who was the main challenger of President Mahinda Rajapakse in the recently concluded Presidential poll is currently “housed” at a chalet within the Naval headquarters precincts in Colombo. Gen. Fonseka who also held the position of Chief of Defence staff (CDS) prior to contesting the Presidential elections is detained pending interrogation into alleged military offences committed by him while in service as Army chief and chief of defence staff. Although a charge sheet is yet to be formulated the General is very likely to face in camera court-martial proceedings at the hands of a military tribunal that would debar media coverage. The manner and mode in which the highly decorated war hero was arrested and detained has come in for heavy criticism by opposition politicians on whom the cruel irony of the man who defeated “terrorism” being treated like a terrorist was not lost. General Fonseka was in his political office at Rajakeeya Mawatte (Reid avenue) near Royal College in Colombo 7 discussing political strategies and campaign tactics for the forthcoming Parliamentary polls with a group of political allies. Among those participating in the discussions were Sri Lanka Muslim Congress (SLMC)leader and MP Rauff Hakeem, Democratic Peoples Front (DPF)leader and MP Mano Ganesan, Janatha Vimukthi Peramuna (JVP) leader Somawansa Amerasinghe and JVP Parliamentarian Sunil Handunnetti. Fonseka’s media secretary Senaka de Silva a.k.a “Shah” Silva was also a participant. Senaka Silva is a former captain of the Sri Lankan Army. The highly confidential discussions were conducted behind closed doors in Gen. Fonseka’s boardroom on the first floor of the building. The security personnel in charge of personal security for the General and other political leaders like Hakeem, Ganesan and Handunnetty were waiting in an outer enclosure. The time was about 9.40 pm when a contingent of military personnel swooped down on the premises in a commando type raid. While scores of soldiers took up positions around and inside the building a special squad burst into the room where the meeting was going on. Before entering the room by breaking down the door the military personnel had disarmed the security officers of Fonseka and other political leaders by relieving them of their firearms. Upon entering the room the Military Police, Provost-Marshal Brigadier Wijesiri had introduced himself and asked the politicial leaders to leave the room as the Army had been instructed to detain and question General Fonseka. The political leaders had objected to this high-handed action and politely refused to vacate the room and leave the General to the tender mercies of his erstwhile military subordinates. At this point General Fonseka had said that if he was to be arrested for questioning then it had to be done in the proper way. He said that the army could not arrest him as he was no longer in the army and that only the Police could arrest him. Fonseka’s media secretary Senaka de Silva had also spoken supportively of the General. When the political representatives tried to intervene they were curtly ordered to remain silent and not interfere in a matter of national security. The Provost Marshall Wijesiri had then said that the General had to be taken into custody by the Military police for interrogation about certain offences committed by him while wearing the military uniform. Since they were military offences it was the military Police that was entitled to arrest him, emphasised the Provost Marshall. He also rapidly read out from his orders outlining the reasons for taking Sarath Fonseka into custody. Sarath Fonseka then protested vehemently and asserted that he would not leave the office unless and until the Police took him into custody and that the military Police had no authority to arrest him as he was now a civilian out of uniform. The military Police officials seemed hesitant to proceed further in the face of the defiant stance adopted by Sarath Fonseka who reiterated that he was willing to submit to arrest by the Police but not the military Police. Suddenly a fresh group of military personnel entered the room. They were led by Major-General Sumith Manawaduge, commanding officer of Colombo district operations in the Army. Incidently it was Maj-Gen Manawaduge who was in charge of an earlier operation on January 26th-27th when a contingent of troops encircled the Lakeside Cinnamon Hotel where Sarath Fonseka and some associates were staying. Manawaduge then barked out orders to the military personnel to take hold of Fonseka. At one point he had rasped to hesitating personnel “Ai balagana inne. Bellen allaganda” (Why are you just watching and waiting, grasp his throat). Egged on by their commanding officer the soldiers then seized their former commander and tried to pull him out. But Fonseka held on to a table refusing to accompany them. He kept on shouting “Let the Police come. I will come then”. When Senaka de Silva also protested , Maj-Gen Manawaduge ordered his men to arrest the ex-captain and hand him over to the Police for further questioning. He then ordered soldiers to drag the general (adagena yande). The soldiers then grasped the hands and legs of Sarath Fonseka and forcibly dragged him along. The politicians witnessing this disgusting spectacle of an ex-Army chief being humiliated in this way remonstrated with the army officers but to no avail as Maj-Gen Manawaduge simply ignored them. Sarath Fonseka kept on shouting and struggling as he was forcibly dragged down the steps from the first floor. Some of the soldiers dragging the General were seen hitting their former commander in a bid to restrain him. One soldier was seen delivering a powerful punch to the back of Sarath Fonseka’s head. When the soldiers assaulted him the General retorted by resorting to colourful expressions and choice epithets in both the Sinhala and English languages. The 59 year old General who had survived an LTTE suicide bomb attempt on his life in April 2006 was manhandled very roughly by the soldiers who dragged him down the stairs by pulling his hands. At one point the struggling Fonseka’s flailing legs smashed into a window cracking the glass pane. The General was wearing brown trousers and a white shirt at the time of arrest. After reaching ground level the General was handcuffed and then bodily carried towards a vehicle. 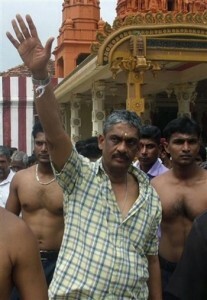 Fonseka then asked the soldiers to put him down saying he would walk without struggling. Thereafter a handcuffed Fonseka walked a very short distance to the bullet-proof Land Rover jeep in which he was taken to Navy headquarters. He has been detained in a chalet within Naval headquarters premises. Detaining Fonseka within Navy precincts is perceived as another attempt to humiliate and anger him as the ex-army chief was at loggerheads with his counterpart former Navy chief Admiral Karannagoda and had constantly undermined the navy during his tenure as Army chief. Senaka de Silva was taken separately and reportedly handed over to the Police for questioning. The political leaders at Fonseka’s office were prevented from leaving the place for nearly half an hour by the Army. The Army also blocked mediapersons from photographing the “arrest” and reportedly confiscated film rolls and cameras from photojournalists working for domestic and foreign media. The SLMC,DPF and JVP leaders who witnessed the deplorable drama have been informing media persons of what had happened exactly “He was dragged away in a very disgraceful manner in front of our own eyes” Rauff Hakeem told Reuters.Hakeem described the act as “authoritarian and vindictive”. A JVP spokesman told Agency France-Presse (AFP) “The General refused to be taken away.They grabbed him and virtually carried him away after threatening the others.There must have been over a hundred soldiers”. DPF leader Mano Ganesan told a Tamil newspaper that the General was “Dragged out bodily like a dog, taken downstairs,handcuffed and put into a vehicle”. 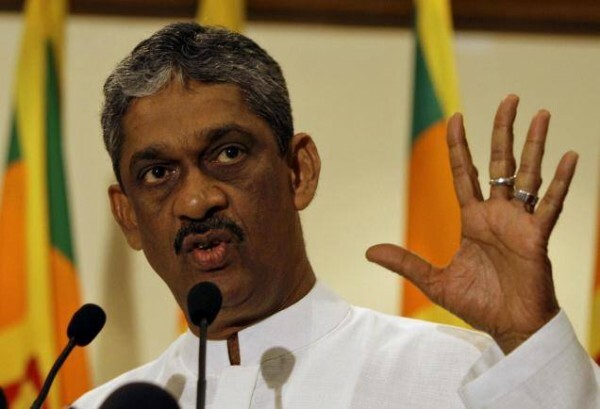 It was only a few hours earlier that Sarath Fonseka held a media briefing where he said that he was prepared to testify in any inquiry into alleged war crimes committed by Sri Lankan armed forces. “I am definitely going to reveal what I know, what I was told and what I heard. Anyone who has committed war crimes should definitely be brought into the courts,” Gen Fonseka said at the briefing. With this “arrest” any such possibility of Fonseka testifying has been ruled out in the near future. Although President Rajapakse won with a majority of 1.8 million votes the opposition has refuted the figures and alleged that malpractices and manipulation on a massive scale had occurred. Fonseka’s arrest could be a setback to opposition efforts to initiate legal action. It is mandatory that legal action should be taken within three weeks of the poll held on January 26th. 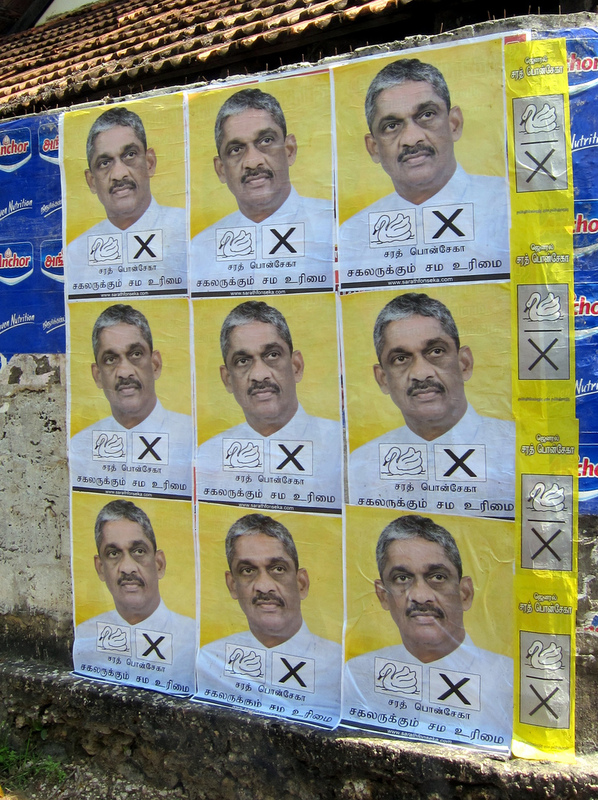 The arrest could also hamper Opposition efforts to contest forthcoming Parliamentary elections on a common platform spearheaded by General Fonseka. Though defeated at the Presidential hustings Fonseka yet remains a key political figure capable of mobilising broad support. Opposition leader Ranil Wickremasinghe currently on a visit to New Delhi has condemned the arrest as “illegal”. Meanwhile efforts are on to “gather” evidence justifying a court-martial trial of the ex-army chief by a military tribunal. Lakshman Huligalle,director Media Centre of National Security and newly appointed and recently promoted Military spokesman Major-General Prasad Samarasinghe have both stated that the General has been detained for questioning into alleged military offences done while he was in service. While interrogation with a view to court-martial Fonseka goes on one level It is learnt that other “investigations” and “probes” are also being undertaken concurrently. One line of investigation is about Fonseka’s complicity in an alleged Coup d’etat conspiracy against the Government. Another probe is about Fonseka’s alleged involvement in an assassination plot against President Rajapakse and his two siblings Gotabhaya and Basil Rajapakse. A third line of investigation is about General Fonseka’s role in the killings of “The Sunday Leader” Editor Lasantha Wickrematunge and Tamil National Alliance MP from Jaffna, Nadarajah Raviraj. It appears that moves are afoot to keep the General detained indefinitely for a while and conduct the Parliamentary poll with him in custody. The General’s arrest has evoked an international outcry with the UN, USA and Amnesty International expressing concern. In a related development a bunch of investigative sleuths from the Police went to the General’s private residence on Queens road and removed his personal revolver. Meanwhile Mrs. Anoma Fonseka has stated that she is very worried about her husband’s health as he has been deprived of medication. Fonseka has to take specified medicine every six hours due to internal injuries sustained when a woman suicide bomber exploded herself at Army headquarters in an abortive assassination attempt.